Before we get started I feel it only proper to say a few things. I have only coached football one year. Back in the early 80's. It was an 8 years old and under team. You get the idea. This is not a technical breakdown, film watching, grading of the coaching staff. Instead, this is what I have surmised from watching the games, and video segments on YouTube. Feel free to disagree, and comment as much as you like on social media, or here on our site. The Auburn defense has steadily improved since the arrival of Kevin Steele. The players praise how simple his scheme is, and how it allows them to play fast and loose. The continuity since Stele's arrival is a real blessing. 2018 should be a banner year for Auburn's defense. 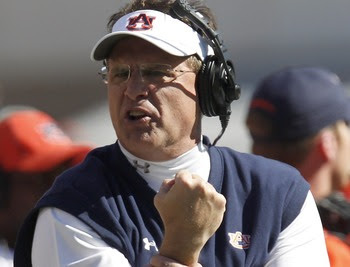 I heard an analyst on SEC Network say "Auburn may have the 4th best defense in the country." I'll say this right now: Improve throughout this season as much as the defense did last season, this will be the best defense in the country! Coach Rodney Garner has continued to recruit at a high level, and prepared his men for battle in the toughest division in college football. Several have gone on to play in the NFL. Travis Williams has been nothing short of a Godsend as the Linebacker coach. He has inspired some of his men to play above their potential. Recruiting quality players, and coaching them up to SEC West ability seems to be something Coach TWill can handle. The secondary coaches have their hands full this upcoming season. Auburn lost a couple of talented DB's in Carlton Davis and Tray Matthews. Overall, I believe this group of coaches is on a level comparable to Pat Dye's and Tommy Tuberville's best units. Lofty company, I know. That's a solid A for a grade. The offense is where things are more fluid. Last season was Chip Lindsey's first as OC at Auburn. The Tigers took down two number one teams, and came within one quarter of making the CFB Playoff. Lindsey continued to run the ball with a much less effective Kerryon Johnson, who was at times injured, while not utilizing the talented group behind Johnson as often as this fan would have liked. Here's where things get tricky. I do not have access to practices, and have never coached any of those young men, so I can not answer as to why this happened. Is it a lack of trust? Is it a lack of ability? I wouldn't think so, because all of these guys were pretty highly recruited. Auburn has had success in the past with two and three RB's. Last season however, the two leading carriers each were injured. Kamryn Pettway was injured during the Arkansas game, and Johnson against Alabama. Kodi Burns has recruited well, and Auburn's receivers blocked well down field last year. Look for more of the same. So many great things have been said about Coach Tim Horton, and still, Coach Horton doesn't get the credit he deserves from the media for his role in the current streak of NINE straight seasons with a 1,000 yard rusher. Think back at the guys that has run the ball under Horton's tutelage since joining Malzahn's staff in 2013. 1.) 2009 Ben Tate 1,362 yds. 2.) 2010 Michael Dyer 1, 093 yds. 3.) 2011 Michael Dyer 1, 242 yds. 4.) 2012 Tre Mason 1, 002 yds. 5.) 2013 Tre Mason 1, 816 yds. 6.) 2014 Cameron Artis-Payne 1, 608 yds. 7.) 2015 Peyton Barber 1, 017 yds. 8.) 2016 Kamryn Pettway 1, 224 yds. 9.) 2017 Kerryon Johnson 1, 391 yds. Coach J.B. Grimes has returned to coach the offensive line at what may be the best possible time for Auburn. Grimes will add to the value of the offensive coaching staff from day one. Thinking back, it's difficult to imagine an OC coming to Auburn and having a better first year. The talent on this side of the ball is truly amazing. Still, play calling, and player rotation lead this writer to grade the offensive staff with an overall B plus. Throw in the lack of top tier kick return coverage, and sub par punt return coverage, and the grade drops a bit. Factor in losing to UCF in a New Year's Day Bowl last season overall grade of B minus. Certainly a good grade, and a passing grade. The big question for me is: Can this staff, step up, improve, and take this team to the top? Get to the playoffs, while winning the SEC would be an A. Winning it all? A plus! Let us hear what you think.